The Marvel movies have shown us locations all across the globe, including fictional countries. We've also seen lots of deep space locales, not to mention the Microverse, Dark Dimension and other mystical realms. When is Marvel going to take us to Hell? Or at least the underworldly realm ruled by Mephisto? A Doctor Strange sequel would seem the most likely place, but I could see a Silver Surfer movie venturing to that dark place as well. Maybe John Constantine and Axel Asher could gain him "Access." My money would be on the third Doctor Strange movie. And, you know, that would be an interesting place for him and John Constantine to just happen to bump into each other. A thought on this cover: it would've been interesting to see Fate in that pose, with Dazzler on stage in front of him. I was writing the above when Cary posted his comment, so that's two independent suggestions for Strange and Constantine in Hell. Separately, I wonder if we couldn't have the Metal Men helping the X-Men fight some Sentinels. Or maybe a photo cover of the movie's Dr. Strange vs. Fox/Netflix's Lucifer for the soul of DCLoT's Constantine? 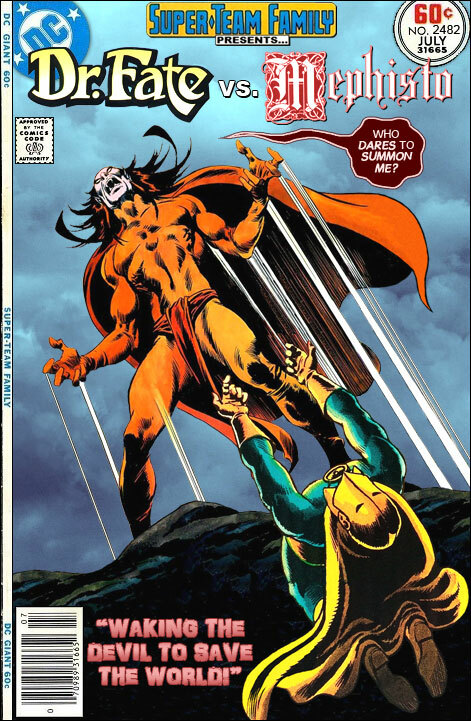 Mephisto stepped in it this time, Nabu the Lord of Order "doesn't play that" as the 90's kids used to say, and neither does Kent Nelson at half helmet mode. The movies have deliberately downplayed any religious references. They're trying to sell to a worldwide audience and can't risk offending people. Even Thor isn't a god in the films, just a long-lived alien. If we're going to see Marvel's Hell it would likely be on a TV series. He and the other Asgardians were downgraded to long-lived aliens back around the mid-Nineties during that search for the World Tree! A subplot that involved an ill-fated Scotland Yard inspector training with the NYPD's Code Blue team (I think). Shouldn't the good Doctor be burning an electric guitar with a pose like that? He could play the CSI: TOS theme. Cary Comic Move Over Rover and let Jimi take over. Which "Jimi?" Hendrix, Hoffa, or Carter? @Anonymous Jimi Hendrix. Famous Picture of him burning a guitar at the Monterrey Pop Festival (year IDK it?) In a similar position as Doctor Fate is here. That's how I correlate it Any-Who. Well, maybe the Silver Surfer can help get Doc's Fate out of the fire. @Cary Comic but Ol Doc fate only has one burning desire. He just wants to start a flame in Inza's heart? @Cary Comic He wants to stand next to your fire. Favorite line speaking to Mephisto: "I'll bet her mother was a fun date." - Doctor Stephen Strange. BWA-HA-HA-HAW!!! !